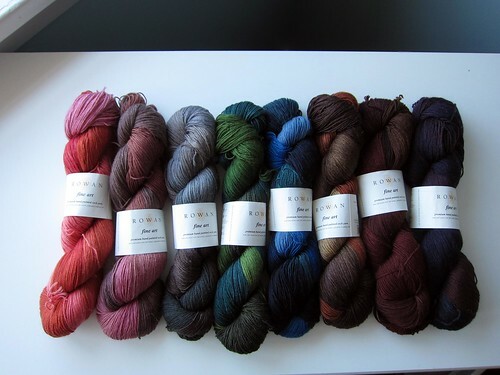 So it’s hot hot hot out there, but heat or no heat, I want to knit with something fabulous, time to break out some silk. 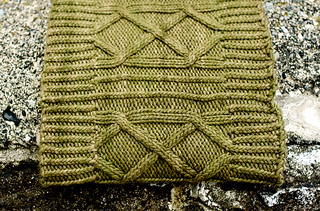 Annabella’s Cowl in Alchemy Silk Purse is the perfect thing for summery knitting! Silk is a dream to knit with and beautiful to wear. Alchemy offers it up in 2 ways: cool and crisp in Silken Straw (you simply must come in and feel this yarn! ), and sumptuously soft in Silk Purse. 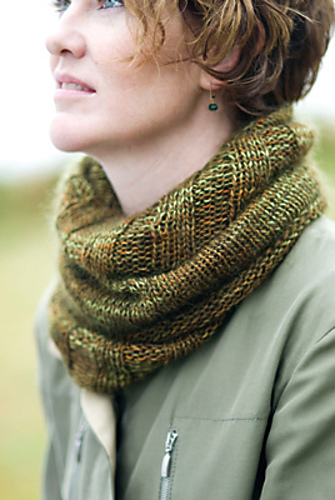 Annabella’s Cowl from Churchmouse Yarns is done in the hand dyed, single ply, Silk Purse. 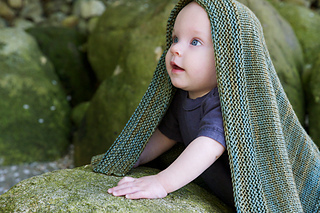 Annabelle’s Cowl is a simple project, perfect for car trips (only one set of needles and an easily memorized stitch pattern), plane rides, or just sitting on the beach! 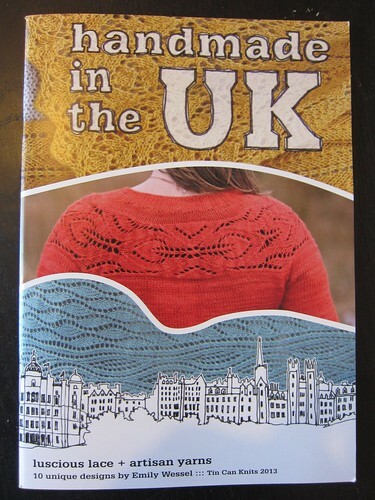 I always need a simple project on the needles for summer, there are so many BBQ’s and evenings on the patio with friends, I need some ‘conversation knitting’. Something I don’t need to pay too much attention to. So the only question is: which beautiful color will you choose?! The funny thing about knitting is that it’s both seasonal and not. While people tend to think about knitting in the fall, when the weather starts to turn, it’s prudent to start thinking about your knitting in the summer. The problem? Who (other than me of course) wants to be knitting in the middle of summer when it’s 28 degrees!? Well I say, let practicality win over comfort, hole up somewhere cool and get your needles out. 1. Beginner knitting: if you haven’t knit before, now’s the time! 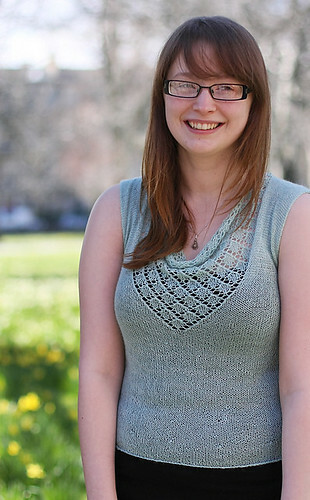 Amanda will start you off on your knitting journey right. 2. Your first sweater: while there are many options for beyond beginner, it’s highly recommended to do your very first sweater. There are lots of techniques to be learned and Amanda knows them all! 3. 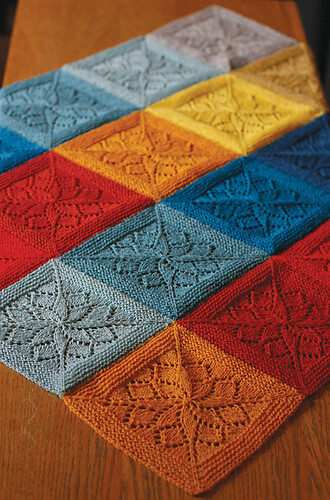 A pile of questions: if your pile of unfinished knitting is starting to add up it might be time to take stock. What point are you at and what are the questions you have. Once you have a list written up, set a time and bring them all in. It’s like spring cleaning but for knitting. Rowan has always been an interesting company to me. A much-storied history paired with many interesting collaborations (Erika Knight, Kaffe Fassett, Martin Storey, to name just a few favourites), but I’ll admit, sometimes their concepts don’t quite… hit the spot with me. 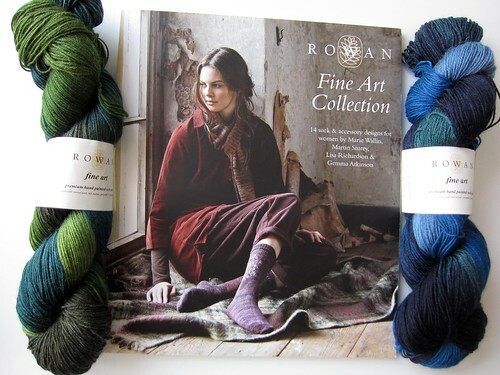 Enter the new Rowan Fine Art collection. 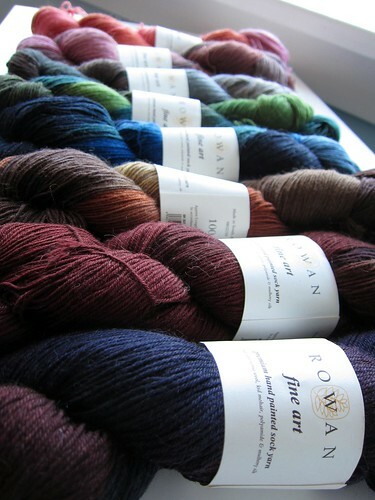 This is a two-part venture, with a new line of yarn (apparently the first sock yarn to come out of Rowan? Really? 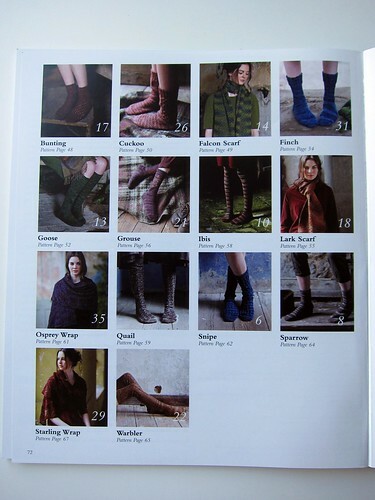 ), and an accompanying book of sock and accessory patterns. First, the yarn. 45% wool, 25% polyamide, 20% mohair, 10% silk. Sadly, the mohair will likely preclude my own personal use of this yarn, but it should make a very durable pair of socks. Oh, did I mention the colours? Rich, deep, dare I say engaging colours? I definitely like – especially the darker, sultry tones. 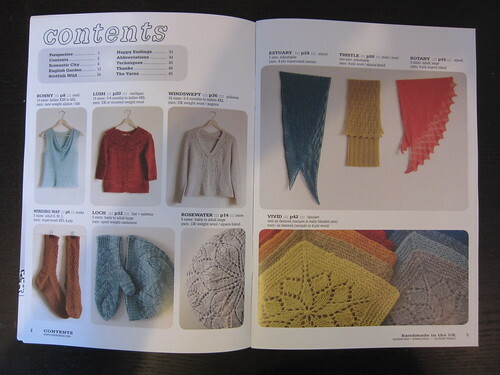 As mentioned before, the is also a book with 10 sock (in a variety of lengths), and 4 accessory patterns. I’m not always a bit fan of variegated yarns, but in this case they work really really well together. Not to mention, the photography and feel is classic Rowan – I just want to dive right in. Rare is the day we get new products in the middle of Summer. It’s not that we don’t love showering you all with new wooly goodness, but come on, it’s hot. We basically work in a giant bowling alley insulated with hundreds (thousands?) 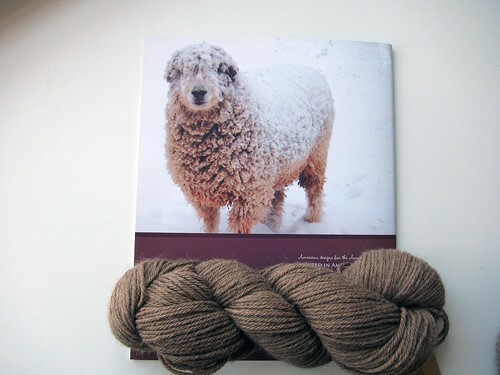 of kilos of wool and other fantastic fibres. Given the… stores sweltering summer state, I was a bit skeptical upon walking in the other day to discover a lovely looking little pile of Something New – naturally, I was immediately drawn to it. On closer inspection, I realized that it was…. Alpaca! Horror of summertime horrors (especially for a self-confessed, dyed in the wool, non-alpaca fan), why oh why did we have a new stash of alpaca in the middle of summer? Well, it turns out we brought it in because it is just a little we bit fantastic. 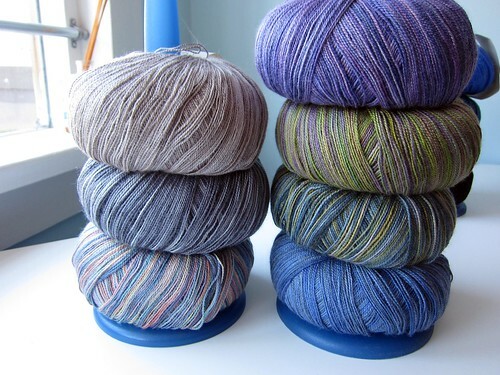 The yarn is by Juniper Moon, and so far we have three different options: Herriot (above), and Findley and Findley Dappled (both below). 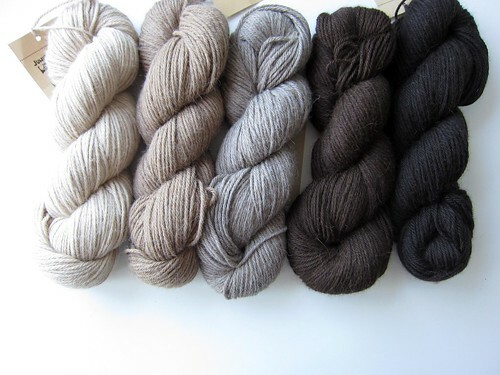 Herriot is a 100% alpaca, 19st yarn in a lovely palette of neutrals. 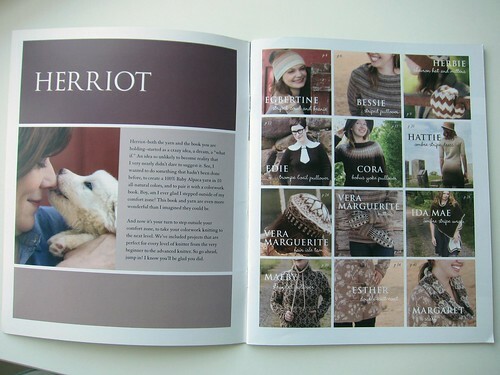 We also have the Herriot pattern book which has some gorgeous designs in it. In the meantime, come check out the new Juniper Moon products. After all, can you really say no to this face? When I was a kid I LOVED dinosaurs. I would practice saying their long names and memorize little tid-bits about each one. Alright, I was a bit of nerd! One year my family went on a road trip to Drumheller and the Royal Tyrrell Dinosaur Museum. My brothers and I were in heaven! A few years ago I took a trip with my cousin and it was just as magical as I remembered. Now I read books about dinosaurs to Hunter and Jones and one day soon we will take them to Tyrrell too. 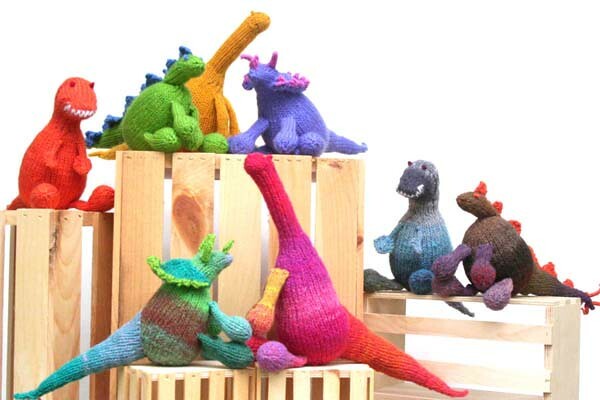 Until then knitted dinosaur toys will have to suffice! Knitting at Knoon has many wonderful patterns for knitted toys (like Feathers and Safari Friends) but the Prehistoric Pals are easily my favorite. 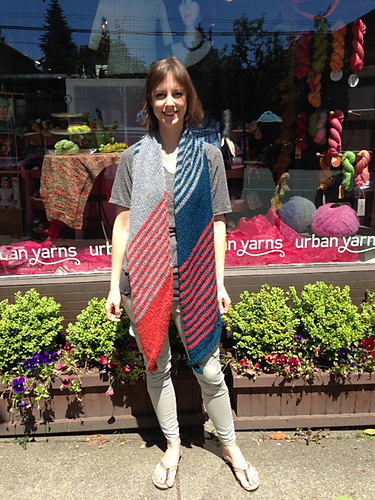 Kathleen knit up a great Brontosaurus in Noro Kureyon and it was just perfect! Toys can be knit in pretty much any yarn but I have a few faves. 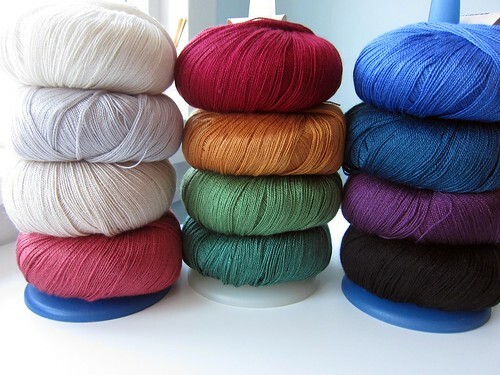 Cascade 220 is a great price and comes in so very many colors, so it works well. Anina likes Spud and Chloe Sweater for their range of colors and washability (toss ‘er in the machine as long as your stuffing allows). Of course there is Noro for a self striped toy, skip changing colors and let the yarn do the work! We have a wide range of Knitting at Knoon patterns along with many yarn options so drop by to create a Stega of your very own!